Dreamy weather conditions for day two of racing at the 19th edition of Argentario Sailing Week with bright blue skies, up to 18 knots of northerly breeze and a race course that took the fleet of classic yachts from the village of Santo Stefano to the antique Roman harbor of Talamone and back whilst sailing along the pristine coastline of Giannella. In the evening, sailors enjoyed a crew dinner organized by Argentario Sailing Week in a breathtaking setting: the 18th Century Spanish Fortress that overlooks the Argentario Bay. 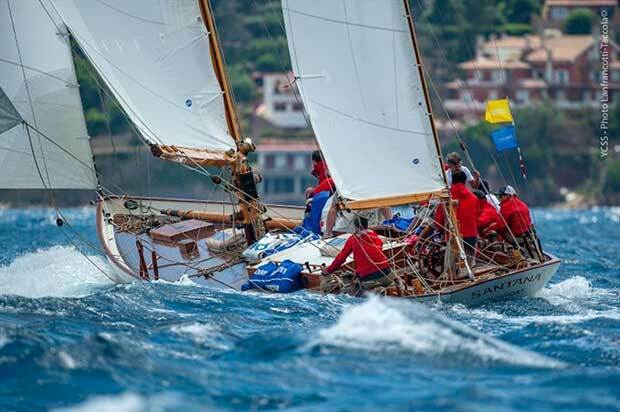 “We are feeling pretty good!” stated Connor Wallace, skipper of Santana (1935 – Sparkman & Stephens) who is racing at Argentario Sailing Week for the first time and is in the lead in her division. “The venue of Porto Santo Stefano is simply amazing and the flat water with steady breeze is fantastic. Even if we are quite focused when racing, it is quite a sight to see rolling hills, vineyards, and the Islands of the Tuscan Archipelago when you look around. I would like to thank Federico Nardi and the Cantiere Navale dell’Argentario for doing such a phenomenal job in fixing our boom overnight and in time for racing. 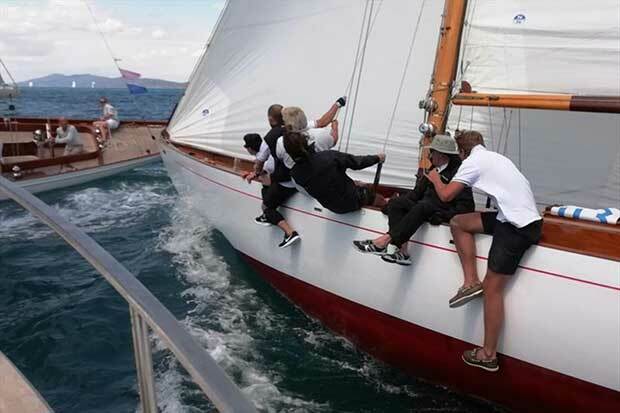 In Argentario Sailing Week, history comes alive and I can honestly say this is a perfect Sparkman and Stephens playground”. The history of this mahogany-planked Marconi schooner is inextricably linked to the lives of Humphrey Bogart and his fourth wife, Lauren Bacall, who owned her for 12 years between 1945 and 1957. The likes of Frank Sinatra, David Niven and Richard Burton were all guests aboard in that time. Santana was design number 59 from Sparkman and Stephens. She was commissioned by William Lyman Stewart, son of the founder of the Union Oil Company of Los Angeles. She changed hands many times and her gaff rig was modified to a yawl. She also took part in the Transpac and the Bermuda Race amongst others. Having sunk in November 1997, Santana was rescued in August 1998 by Christine and Paul Kaplan who restored her and gave her back her schooner rig. “Challenging and Breathtaking” are the words of Argentinean German Billoch back on the docks from racing on Cippino II (1949 – German Frers) as he prepares to go out on his Moth dinghy to train for the European Championship scheduled in two months. “We are just getting to know the race area as this is the first time we sail at Argentario Sailing Week and I can say that this fleet is more competitive than other venues. The people and organization are all extremely welcoming and friendly and the scenery is unbeatable. This is also proving to be a fantastic event to learn more about how to manage the crew and we are learning from other boats as well,” stated young Billoch, who is sailing with his father Martin (mainsheet) and brother Cristobal (navigator) having inherited his love of sailing from his grandfather, Patricio. Cippino II was designed between 1947 and 1949 She is the sister to Fjord III and was launched in Buenos Aires Argentina in 1949 racing in the Buonos Aires to Rio Race. Cippino II was not raced much during her first years, she was more used as a pleasure day sailer boat and was always keep in very good shape. Brought back to racing circa year 2000, by the previous owner, on the Argentinean classic regattas circuit. Under Daniel Sielecki ownership, Cippino II raced during 2016 in Argentina. “Stuff of Dreams” stated Olympian (1913-Gardner) skipper Guillaume Fetas. “This is the first time that I sail past the Island of Elba and close to Giglio and Montecristo and this venue and setting is whaat dreams are made of. The race course is a technical one and keeps you on your feet; no mistakes are allowed here, particularly in sail choice. If Olympian is here today racing with this configuration it is thanks to Bruno Troublé who found the boat in abandoned in Chicago years ago and immediately proposed her to the current owner saying – Just buy it, and I, Bruno, will manage her restoration -. That is why in many ways we consider Troublé to be Olympian’s godfather,” Fetas concluded. Olympian (sail number P-14) is a P-Class, a late 19th century racing yacht of which it is estimated around 20 were built in all. Just five are still sailing. Olympian spent almost her entire life in the US. In 1913 and 1914, she won the famous Mackinac Race on Lake Michigan that starts out of Chicago. She was rediscovered in the Chicago area in 2013 by Bruno Troublé, father of the Louis Vuitton Cup and skipper of the French America’s Cup campaigns of 1977, 1980 and 1983. Troublè supervised her restoration which was carried out by master shipwright John Andersen at Camden in Maine. In June 2014, Olympian was cargo-shipped from Newport to Genova. Argentario Sailing Week is organized by the Yacht Club Santo Stefano in partnership with the Florentine haute horologerie brand Officine Panerai. The regatta will finish on Sunday 17 June.